Frank Stitt, owner of Highlands Bar & Grill in Birmingham, Alabama, started his culinary education by working for the late great cookbook author Richard Olney in Provence, France. This tart is the final dish in a dinner party menu designed by Stitt and inspired by Olney’s love of seasonal produce and great wine. If you don’t have a tart pan, roll the dough into a 12-inch square and place on a parchment paper-lined baking sheet. 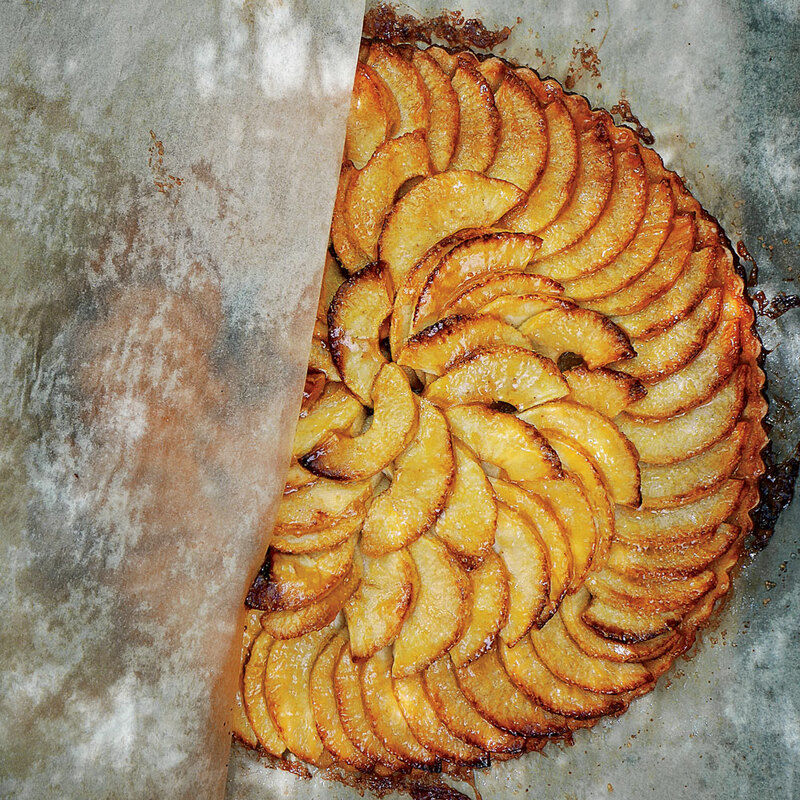 Top with apples, shingled to the edges, and bake at 375°F until crisp, about 45 minutes. Place flour, granulated sugar, and salt in bowl of a food processor; pulse until combined. Sprinkle cold butter cubes over top, and pulse until butter forms pea-size pieces. Add 1/4 cup ice water, and process just until dough resembles wet sand, adding 1/4 cup ice water, 1 tablespoon at a time, as needed to reach desired consistency. Turn dough onto a floured work surface; knead just until dough comes together, 2 or 3 times. Shape into a disk; wrap in plastic wrap, and chill 1 hour. Preheat oven to 350°F. Roll out dough disk to 13-inch round on a lightly floured work surface. Lift into an 11-inch tart pan with removable sides; press dough into pan. Trim edges and prick dough all over with a fork. Refrigerate 30 minutes. Gently toss together apple slices, melted butter, and coarse sugar in a large bowl. Shingle apple slices in a circular pattern around outside edge of prepared pan, working into the center. Bake in preheated oven until golden brown, about 1 hour. Cool 20 minutes. Stir together apricot jam and remaining 2 tablespoons water in a small saucepan over medium. Cook, stirring often, until melted and smooth. Brush top of tart with apricot glaze.